The sorcerer can do powerful miracles, a Buddhist can be kind and very loving, and a Muslim can say very wise things. Powerful miracles, loving kindness, and wise sayings can be used to glorify God. But those things without the context of a faithful covenant with Jesus Christ are actually spiritually worthless, and probably harmful. An exclusive covenant relationship with the living speaking God through the blood sacrifice and grace of Jesus Christ. A true Christian doesn’t put his faith in the pigpen of other religions competing for slop. A true Christian is not the one trying to be down and fit in like life is a permanent high school popularity contest. A true Christian is in the “in crowd” of Heaven, and growing the crowd with true leadership. A true Christian is not like the kid trying to get a date. A true Christian is the one married to Christ already. There are two spiritual states: in covenant with Christ or deceived in sin. Christ is not in competition with other gods for relevance. All other idols are nothing, but they represent devils (1 Cor 8:4, 1 Cor 10:19-26). A true Christian understands this and lives accordingly, teaching truth and showing love from a position of authority and with spiritual power. A true Christian doesn’t compromise and make unGodly covenants with unbelievers to get fake conversions and publicity or exposure. A true Christian that knows who their God really is represents God with holiness, repentance, power, and exclusive love. Daniel 11:32 the people that do know their God shall be strong, and do exploits. – Those that know their God will be strong and do exploits. Knowing God gives you a position of strength. Acts 17: 30 And the times of this ignorance God winked at; but now commandeth all men every where to repent. – Those following and imitating God are also commanding men everywhere to repent, and turning people’s hearts to Him. Hosea 2: 16 And it shall be at that day, saith the Lord, that thou shalt call me Ishi (Husband); and shalt call me no more Baali (Lord). – Also see 2 Corinthians 11:2 For I am jealous over you with godly jealousy: for I have espoused you to one husband, that I may present you as a chaste virgin to Christ. You have made the subtle switch from biblical Christianity to apostate confusion. Substitute hip hop for any culture or subculture, and this is still true. Your fruit is ruined even if you still “quote scriptures, do miracles, and say nice things.” Why? Because you’re not representing God for who He really is. You’re not representing POWER, REPENTANCE, or EXCLUSIVE COVENANT. Why would you switch from hip-hop being an option within Christ to making Christ an option within hip-hop (or any culture, for that matter)? When you know God, you know what your spiritual last name is. The last name is the name of authority; it’s the name that’s passed on. If you’re really married to Christ, you’re not trying to hyphenate his last name. It’s Christ. No hyphenations. God’s kingdom takes preeminence permanently. It’s an EXCLUSIVE COVENANT. Like a wife who doesn’t want to take her husband’s last name all the way, you want a way out. You want to leave an open door to keep your old identity. You want to keep remembrance of your old identity, because you don’t really want to change it anyway. You want to make divorce easier, so your covenant probably isn’t really real to begin with. If you prepare for divorce, is your covenant real? Hebrews 11 15 And truly, if they had been mindful of that country from whence they came out, they might have had opportunity to have returned. 16 But now they desire a better country, that is, an heavenly: wherefore God is not ashamed to be called their God: for he hath prepared for them a city. People that are mindful to keep the identity of where they came from have an opportunity to return. But people that don’t look back to their old identity prove that they are looking for heaven, therefore God is not ashamed to be called their God. If you are not ashamed, but God is ashamed, what’s more important? When you make the switch from preacher of righteousness to a motivational speaker that just happens to be in church on Sunday, you have switched into apostasy. That is, unless you: show exclusivity to Christ, (not putting Him in a bidding war with the other options) demand repentance, and exalt His name higher than your name as in a marriage. When you refuse to be labeled as a Christian, you are effectively trying to divorce God by refusing to be associated exclusively with His Bride. When you place Christ besides other options, you effectively cheapen the gospel. Let’s say America names you the greatest preacher, and decides to publicize you, get advice from you, and put you on a pedestal. Your job is to show that you are married to Christ, with his last name superseding yours (EXCLUSIVE COVENANT). Your job is also to show that He is your provider – you don’t need them to provide for you (POWER). Your job is also to make sure that they know that He commands them to repent and commit themselves to Him exclusively as well (REPENTANCE). Let’s say you are invited to pray for the Presidential Inauguration. Your job is not to make the nation comfortable and say “everyone pray in the name of their god, while I pray in Jesus name.” You don’t get to take a day off from commanding men everywhere to repent. Your job is to say thru your prayer that there is only One God, and Jesus is the way. This shows that you don’t need the power, money, fame or platform that the President gave you, because God is your Provider. That shows Gods power. Your exclusive commitment portrays God for who He really is and accurately reflects what he requires from Believers. The true God is not an option on a buffet line, so to sell Him short is apostasy. If the President is a different religion, and you change your ministry to fit his religion instead of command repentance, that’s a violation of covenant, and getting benefits from it is spiritual prostitution. Let’s say one day America names you the greatest Christian rapper. Your job is not to try your best to fit in and present Christ as the best option while you marry the hip hop culture. Your job is to present hip-hop as optional while you marry Christ. It’s to represent exclusivity to Christ. You need to sign no covenants or contracts with unbelievers, you don’t need their acceptance even if they gave it to you. You still command men to repent. Your job is not to distance yourself from the niche market formerly known as the bride of Christ. But a Muslim doesn’t have to call himself a Muslim rapper? Why do I have to distinguish myself in Christ? Covenant with the Creator thru Jesus Christ is Christianity. Other religions don’t compete with Jesus, they compete with each other as a whole league of invalid deceptions to distract from Jesus. The reason they don’t have to be exclusive is because they are all the same – sin and deception. If you don’t know the difference in spiritual status between Islam and Christianity, are you really a Christian? Just the fact that you asked that question is a reason for you to examine yourself and see if you are in the faith. Are you even a believer? Islam is just a religion. Christianity is representing Jesus Christ with POWER, COMMANDING REPENTANCE, and in EXCLUSIVE COVENANT. What if America names you the best Christian plumber? Do you have to write Jesus on all your pipes? Plumbing is not preaching. Plumbing is working with your hands. Preaching is a form of expressing convictions and beliefs. Music is opens up emotions to express affection, commitment, and devotion; i.e. worship. Music is a spiritual thing. Preaching is a spiritual thing. Plumbing is not. Plumbing and preaching are not equal. Music and plumbing are not equal. If you are a Christian plumber and someone asked you what your testimony is, you tell them. If it’s true to Christ, it will probably show POWER, COMMAND REPENTANCE, AND SHOW EXCLUSIVE COVENANT. If you are a preacher and someone asked you your testimony… How is your testimony true if it is opposite of what you preach? If you’re preaching is not exclusively for Jesus Christ, is not married to Jesus Christ – and your worship is not exclusively for Jesus Christ and not married to Jesus Christ – then what testimony are you going to give them? Are you going to give them a testimony that is opposite of what you are actually doing? If you make a decision to be a preacher or a decision to be a worshipper you’re making a spiritual decision. This is not a decision to make tents or do plumbing. Paul demonstrated the professions of a Christian. He did not make idols for Diana or Zeus on the side. He did not supplement his ministry with a career that had spiritual influence against his ministry. He worked with tents, inanimate objects with no spiritually negative influence. He supplemented his ministry with income from working with his hands to demonstrate and lead by example. BiSpirituals claim to be doing the works of Paul, but Paul demonstrated exclusivity to Christ, marriage to Christ. Paul also commanded men everywhere to repent, and Paul did not need provision from work in idolatry. BiSpirituals say they are like just Paul, being all things to all men… But what was Paul to idolaters? He was a punching bag and a rock target. Paul’s ministry was against the worshippers of Diana. Paul decimated their profits with his ministry, so their trade union got together to try to kill him. 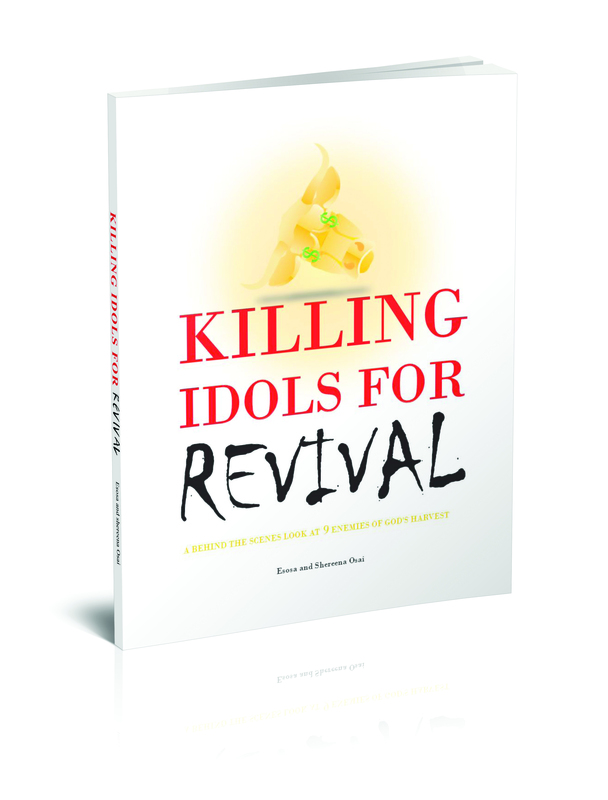 What is your ministry doing to the idolatrous professions of our time? Paul got beaten and persecuted by idolaters. That’s called taking up your cross. He did not partner with them to make some extra cash or spread his “gospel”, because that would’ve perverted “the Gospel”. (See Acts 19). No, Paul didn’t write “Jesus” on all his tents, but he bore the reproach of standing for Christ exclusively in his ministry. He did not partner with idolatry to make his ministry bigger. If he used his speaking gift to sell his tents door to door, or made a musical jingle as a commercial to sell his tents, would that be sin? I doubt it. Tents are not idolatry. If he did the same thing for the temple of Diana, it would be sin. People that use this “Christian Plumber” metaphor as an excuse for compromise – the Bible defines them as fools. ARE YOU MAD? No, but Yes. Their secular pimps will put them out on the street, then they will return to their Father God, and he will accept them with open arms. We all were whores at some point, and when we are forgiven much, we can love much. Either that will happen or, they will fall in live with the acceptance and maybe the money their spiritual pimps provide, and die in their sin and destruction. What I am mad at is the fact that the Body of Christ accepts spiritual whoredom as if it was really ministry. We turn the prostitutes into heroes, and they don’t even repent. They use their sin as springboard marketing into a better career outside of the “niche market” formerly known as the bride of Christ. People imitate what they see… so the corruption spreads to the little ones, it spreads to the next generation that may have actually wanted to worship him in spirit and in truth, but now have been corrupted through ignorance. But what if they are representing Christ to the world? No they are not. If I want to be a missionary to Brazil or Guatemala, I don’t go there honoring ancient Aztec and Inca idols. I go there, I learn and speak their language, I love them, and I represent Jesus Christ EXCLUSIVELY. I command them to REPENT. And I operate in the POWER of God. There’s a huge difference between “speaking someone’s language” and honoring their idolatry. And if you are a native Brazilian ministering to Brazilians, and you choose honor your culture over Christ, are you really a Christian at all? If you honor cultural idols or popular protocols over Christ, are you really a Christian at all? Jesus told you that you have to be willing to hate your own father or mother in order to follow Him, and you won’t even hate the idols of your culture? If my wife wants to help out the household by making some extra cash, one thing I DON’T want her to do is go and be a prostitute. But what if she is talented enough? No. Why not? Last name. Exclusively mine, anyone that wants to defile that needs to repent. But what if she is attractive enough? No. Because she is EXCLUSIVELY mine, I have the POWER to provide for her without prostitution income, and you need to repent for asking. But what if people really like her and they want to put her on a pedestal? No. How about she dance at this gentleman’s club? They won’t touch her and they’ll really pay a lot. No. She’s exclusively mine. We don’t need that money. Repent for thinking about it. THIS IS THE LAMB’s WIFE! The Lambs Wife is His alone, and one of the most tragic things going on right now is spiritual wolves playing games with the Lambs Wife, and defiling her by example. I’m using completely biblical language and translating it to today’s terms to address a problem that has been growing in the body of Christ for several generations. This is not a debate or an intellectual argument. This is the Lamb’s Wife! She is to behave herself a certain way. We are just trying to get her ready for Jesus Christ’s return. Next, part 2 Don’t Light a Whorehouse When God is Building a Lighthouse. This is one of the greatest prayers in the bible, one that shows humility and at the same time opens you up for God to blow your mind with supernatural revelation. God is actively and seriously looking for people with the heart to pray this type of prayer (Isaiah 66:1,2). I dare you to add it to your prayer language and see what God will do! Have you ever considered that both Cain and Abel were trying to worship God? So why was Cain’s offering rejected, and Abel’s accepted? Why did Cain end up a murderer, and Abel end up dead? What was the point? From the beginning, God made it clear that it takes the shedding of Blood to cover sin. He killed an animal to cover Adam and Eve. Both Cain and Abel knew that. Abel obeyed God and offered from his care of the flock. Cain disobeyed God and offered to God from his work in the field. God doesn’t need the works of your hands if you don’t participate in the care for His flock. The Slain Lamb will always be in his flock, and true shepherds feed the flock. There’s a lot of being offered to God that God is completely rejecting, because those that offer it are rejecting the Lamb and disregarding his flock. They esteem the works of their hands, their talent, their money making and fundraising ability above obedience to the Lamb and feeding His flock the exact food He gives in due season (John 21:16-17) (Luke 12:42-48). Don’t be a modern day Cain, trying to offer God worship without the Lamb and His flock. We can’t give God what we want instead of giving Him what He asked for. If we really knew the power in the faith- filled word- filled, spirit-filled tongue of a believer that walks in integrity, we would realize that we are the absolute most powerful thing on this planet, the very conduit of God on earth… We would realize how much authority we have in this earth and how much the entire spiritual realm trembles and watches for our words. Saints We ARE the Authority! God gives us this Honor as We Abide in Jesus Christ and Live in Praises to His Name. CHRISTIAN HIP HOP HISTORY: Did you know that there were THREE Cross Movements!!! There was the musical group, the Record Label and the Non-profit Organization. Even though, as a group, The Cross Movement came together in 1994 and started our record in 1997, the group was not fully supported by our traveling music ministry until about 2004! A lot of young artist are intent on being in “full time ministry.” But until the year 2000, all of the members of the group worked regular jobs even though we traveled almost EVERY weekend. In 1997, aside from starting a label we also started a non-profit organization. In 2000, one of our board members gave a 6 figure donation to our ministry which freed most of us up to leave our jobs. But from 2000 to 2004 we, along with a small but dedicated staff (shout out to Tony Bruno, June Wilson and DJ Official, were supported by people like YOU. Many fans-turned-family from all across the country gave us monthly donations to keep our ministry afloat. And members of the group, unless they were in school or working for the label, worked every day in the ministry office playing various roles. Though we never charged for our ministry we did have a “suggested honorarium.” Around 2005, record sales began to add up and on top of that, the individual sponsors for our various shows began to consistently meet our $uggested honorarium. As a result, the rap group began to support the ministry and we stopped asking the public for donations. I share this lesson from the Phanatik because people imitate what they believe to be successful. A lot of holy hip hop is corrupted and not holy anymore because people are imitating what is successful in man’s eyes not God’s. I encourage good and faithful servants to teach more and tell their story. They could save a lot of young ministers from spiritual destruction if they knew what they really should be aspiring too. Teach More and tell the Story Louder! Warnings and Repentance is the salad. Instructions and Requirements are the meat. Promises and Rewards are the dessert. Most Christians just eat dessert. They don’t last. Some Believers eat meat and dessert. They last a little while, but end up diseased. The ones that eat all 3 courses are the strong and productive Overcomers that endure to the end.